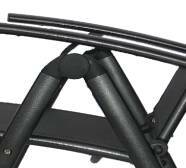 Our frames feature the highest quality extruded aluminum and reinforced internal walls for extra support. 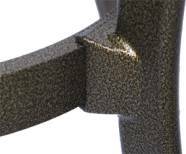 We use the most up to date profile shapes and our heavy wall aluminum extrusion eliminates wobble or walk. All welded surfaces or connections are welded 360° around, leaving no weak points or spaces. Our solid cast aluminum frame components are individually formed through the ancient art of sand casting. Each frame is hand-welded using full circumference 360 degree argon-arc welding technology and then inspected for both strength and appearance. Frames are then hand sanded and polished prior to finishing. Welded surfaces or connections are welded 360° around, leaving no weak points or spaces. Finishes applied to frames are made from the highest quality paints. Our Premium finishes are baked on using superior powder coated paint. Premium paint finishes withstand peeling, blistering and oxidation. Our frames are passed through a pre-wash system, a polyester powder coat is then applied electrostatically and baked on to achieve a clean smooth finish. Our finishes are virtually maintenance free! Each H&B frame passes through a three-step pre-treatment process to guarantee superior paint adhesion. In addition to the base finishes, many of our frames have a secondary complementary color which is hand wiped over the base color, resulting in subtle shading and highlighting that dramatically emphasizes the detail of each unique design. For premium finishes, H&B’s classic coating is hand-applied and sealed with a clear, low-gloss powder coat. We use only the finest mildew, fade resistant and durable acrylic fabrics! All of our contemporary and beautifully designed weatherproof fabrics are made with imported technology. Our fabrics are specially treated to resist stains, wear and the sun's harmful rays. Our fabrics are specially treated to resist stains, wear and the sun's harmful rays. All slings are precision cut and then sewn around a tough, flexible nylon spline using polyester thread that is double sewn at all reinforcing points. Slings are then inserted into a channel for superior strength and durability. 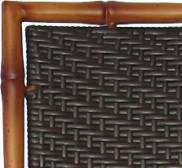 ALL SEASONS outdoor wicker is constructed using cutting edge synthetic fibers, hand woven over an aluminum frame. With this combination of resilient, weather-resistant materials and H&B’s quality workmanship, All Seasons wicker will last for years. 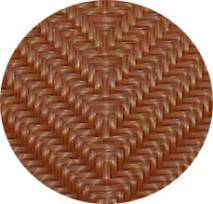 With the combination of resilient, weather-resistant materials and H&B’s quality workmanship, the wicker will last for years. All glass table tops are constructed of 5 millimeter tempered glass, which is approximately 5 times stronger than ordinary glass. Tempered glass is difficult to break, scratch or damage from heat or cold. 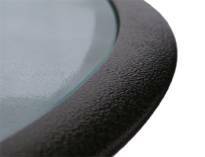 All glass table tops are constructed of 5 millimeter tempered glass. © 2005 - 2006 H&B Furniture Co., Ltd.